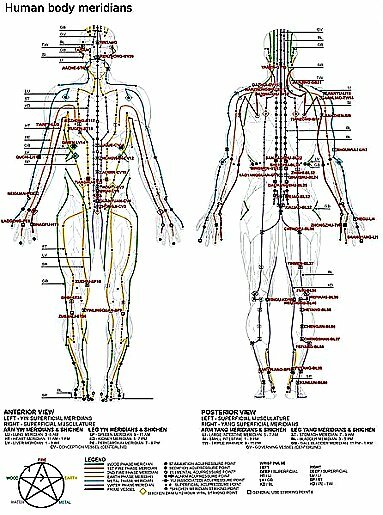 EFT is a technique in which you tap on acupuncture points on your own, or with an EFT practitioner guiding you to heal both physical and psychological issues by releasing emotions and blocked energy in your body. There are other names for this type of work which include Meridian Tapping and Thought Field Therapy, all of which have fallen under the general headings of Energy Psychology and Energy Medicine. EFT is a simple version of these remarkable healing modalities which release blocks in your life energy flow and as a result reduce the stress that underlies much of the dis-ease we experience. For me healing has been all about finding personal peace, but along the way I learned that personal peace has a lot to do with the flow of energy in our bodies. As I learned more about EFT, I learned also about the body of energy that is in and surrounds our physical body and that many of our physical and emotional issues are caused by blocks to the flow of our energy. The more I used EFT, the more blocks to the free flow of that energy I have released and the more peaceful I have become, even through recently losing my life partner to cancer. The practice of EFT is undeniably one of the quickest, easiest and most profound methods of releasing emotional blocks, fear and anxiety, of the many methods currently being used by coaches and therapists. We need our energy or life force flowing freely for a healthy and happy body, mind and spirit. The practice of tapping on acupuncture points while focusing your mind on what is causing you fear, stress or pain sends a calming signal to the amygdala in the brain. The amygdala is the part of the brain that sends out the red alert of fear or stress to the body, and releases adrenaline or cortisol. These chemicals would help the body run if it were actually in danger, like being chased by a tiger. Since we are not being chased by a tiger these chemicals and their effects land and get stuck in our body, creating blocks to our energy. We often experience long term pain and suffering as a result of these blocks. Along with the calming signal that EFT helps send to the brain, it clears the blocks with the energetic vibration created by the tapping and helps your energy to flow normally again. Once you are feeling de-stressed and re-energized after using the technique of EFT, you are better able to focus, better able to make decisions and more in harmony with your natural spirit. 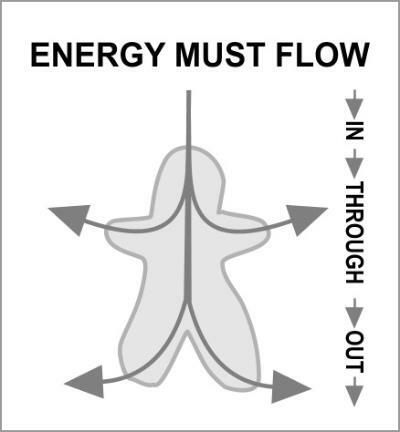 The diagrams below illustrate the difference between a happy healthy energy body on the left and the blocked disturbed energy body on the right. 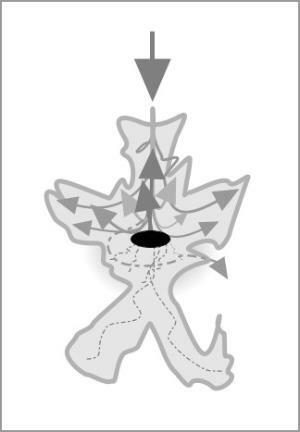 One taps on a series of acupuncture/meridian points while thinking and speaking about an issue you are wanting to clear or regain balance with. This process releases the energetic block and in so doing deflates the emotional charge attached to it. Afterword you can think about the issue, but not feel the emotions of sadness or anger with the same intensity, if at all. EFT also works to lessen pain and decrease other physical symptoms. The "Basic Recipe" the sequence of tapping points developed by Gary Craig, EFT's founder. It is somewhat simple to learn but was designed to be both a creative and organic process which develops with each person and situation. has been known and worked with by healers for several thousand years or more, but in our western culture we lost the history, practices and ancient wisdom of eastern and indigenous medicine and healing. To experience and EFT session with me, where I teach you the basic recipe and guide you through some of the more creative tapping routines that effectively reduce stress and increase calm and peace, contact me.